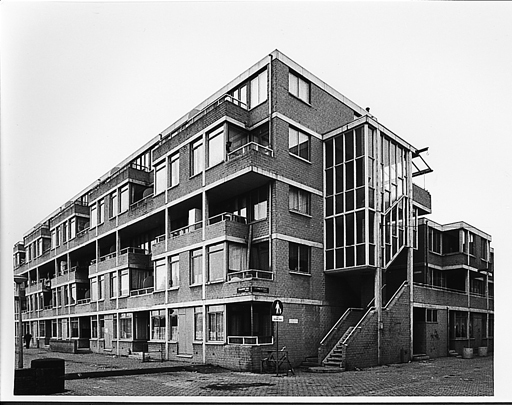 After a protracted campaign against the threat of office development, housing was given conclusive priority on Bickerseiland with the building of these 158 dwellings: two virtually closed blocks and two peripheral terraces in which existing houses and buildings have been absorbed. Dwellings are reached from access galleries with corner staircases. Facades are split between two planes 1.40 m. apart. With in this area access galleries, balconies and bay windows combine in a coherent, rhythmic play of surfaces.